Here's proof that West End Arts is a volunteer group. 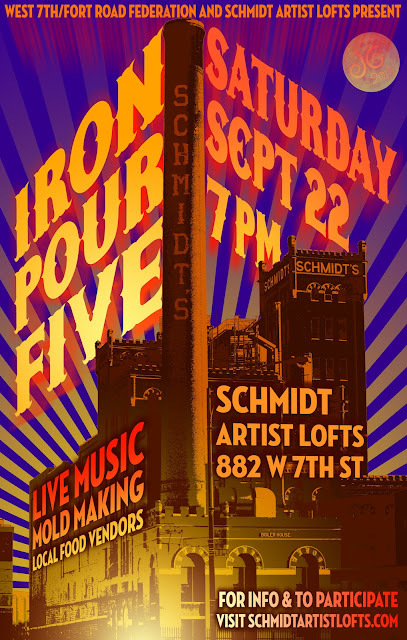 Dominium, a private housing developer has picked up the ball this year for the annual iron pour. It was the only way WEA made it's presence known. This year, that isn't even going to happen. WEA is now a brand with nothing to brand. Only YOU can bring it back to life. In honor of Nance Derby Davidson the acting chair of WEA who does more than anyone I know to support the arts in West 7th and is busy doing her part by creating and improving the Acme Academy of Arts at 937 W. 7th, and the fact that I am still doing the poster for the iron pour thereby contributing in a much lesser way than Nance because I actually got paid for it, I submit the latest poster.